The American Recovery and Reinvestment Act (ARRA) of 2009 includes changes to employers' COBRA responsibilities. Sage Accpac's March 31st 2009 U.S. 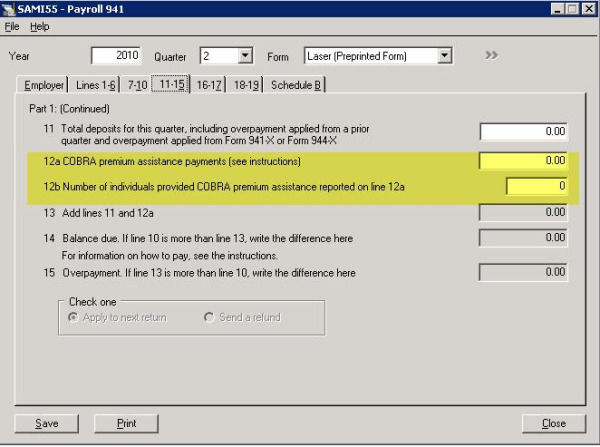 Payroll Tax Update included the additional 2 lines required to accommodate the new stimulus package's requirements for COBRA Premium Assistance Payments. Below are screenshots highlighting the changes with regards to the new COBRA lines on the Form 941 and Sage Accpac US Payroll. Select the 941 icon within Sage Accpac US Payroll. Select the year, quarter and form type. Enter the COBRA premium assistance payments amount in line 12a. Enter the number of individuals provided COBRA premium assistance reported in line 12a in line 12b. 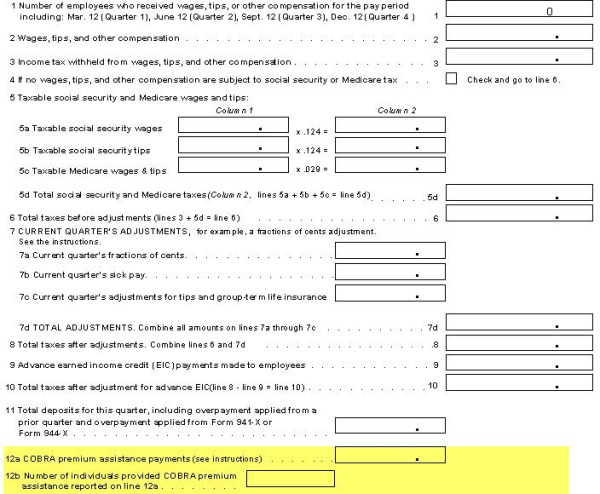 Below is the Form 941 with lines 12a and 12b highlighted. Not current on your Accpac Payroll Tax Updates? Interested in using Sage Accpac Payroll? Is your HR Department having trouble administering COBRA enrollment and payments? Contact us for more information on Sage Accpac Payroll or HROffice.